In the bleak and bitter cold of a copper mine in northern Japan, a Chief Petty Officer of the U.S. Navy was given an opportunity to write a prisoner-of-war card for his wife. 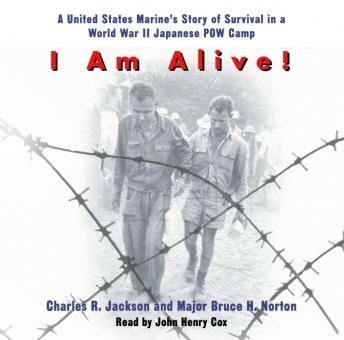 He was allowed ten words—he used three: “I AM ALIVE!” This message, classic in its poignancy of suffering and despair captures only too well what it meant to be a prisoner of the Japanese Army. Now, acclaimed military historian Major Bruce Norton USMC (Ret.) brings to light a long-forgotten memoir by a marine captured at Corregidor in the spring of 1942 and interned for three devastating years by the Japanese. With unflinching prose, the words of Marine Sergeant Major Charles Jackson describe the fierce yet impossible battle for Corregidor, the surrender of thousands of his comrades, the long forced marches, and the lethal reality of the P.O.W. camps. Joining some of the most important eyewitness accounts of war, I AM ALIVE! is a testament to the men who fought and died for their country. Jackson’s unembellished account of what his fellow soldiers endured in the face of inhumanity pays tribute to the men who served America during the war—and shows why we would ultimately prevail.